Here are some photos depicting fire rehab for a landowner protecting their property near Keswick this week. See the last blogs, but the purpose was to establish CA native grasses to kick start natural succession (healing) the way nature intended! 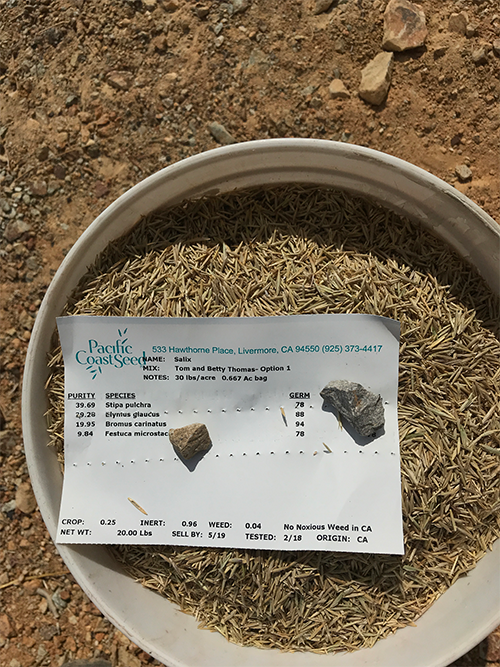 To get CA native grasses instead of star thistle, noxious annual grasses and ultimately the fire-prone Knobcone Pine (climax species ??) we need to add the symbiotic mychorrizae fungi, a slow release biotic fertilizer (BioSol and Sustane are examples), AND the proper selections of native grass species. Even two of my favorite species, Elymus glaucus and Nassella pulchra, that grow in the same area but one (NP) likes hot dry, south-facing slopes and EG proliferates on slopes with a little shade occasionally. For this property (fortunately the house was spared) I developed two different mixes, one for south-facing and one for north-facing slope. Measure, weigh, and calibrate – especially if you seed by hand. I like seeding by hand because I have more control. See the prior videos. we also had a mini excavator on hand, helping “toss” some bales down the slope! Drainage drainage drainage. Now is the time to treat old skid roads or ? that can turn into gullies. After a fire, these historically benign drainage features can become big problems. I used a small excavator to “remove” and re-contour, thus correcting the drainage anomaly. The old skid road has now been re contoured. We have done many miles of logging road removal in Whiskeytown NRA and adjacent Grass Valley Watershed – back in the day.